The site charges $11.99, but for some people, that's a small price to pay. Has anyone died in your house? Do you really want to know? Whether the answer is yes or no, there's a way to find out. DiedInHouse.com is a site that allows you to enter your address (and your credit card info—this stuff doesn't come for free!) 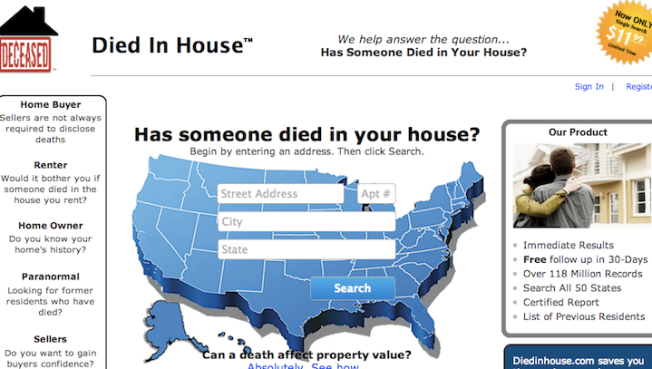 to discover if, and how, someone has passed away in your home, as reported by Gothamist. For some people, the knowledge ($11.99) is worth the price. The tool seems like it was created for paranoid or superstitious house hunters who want to know everything—absolutely everything—about their dream home. A death in a home, particularly a ghastly one, might not be the kind of information your realtor will volunteer. It could also aid house sellers who want to be more confident about their sale. "The materials appearing on any Simply Put Solutions, Inc. the creators of Died in House found at www.diedinhouse.com (DIH) web site and/or owned application could include technical, typographical, or photographic errors."